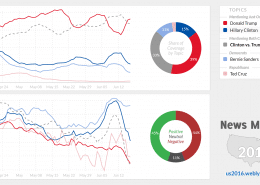 In 2016, a team of European researchers led by webLyzard technology released a novel election monitor to track the public dialogue and the candidates’ performance on the campaign trail. The system has recently been upgraded and extended with a focus on the US Midterms 2018. 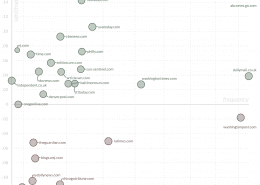 Real-time analyses of online coverage based on the webLyzard Web intelligence platform reveal opinion leaders, shed light on events that impact the coverage and compare stakeholder perceptions. 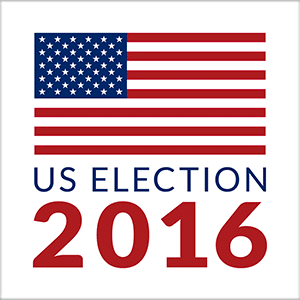 Like no other US Presidential Election in recent history, the race Clinton vs. Trump polarized the electorate and the resulting coverage. 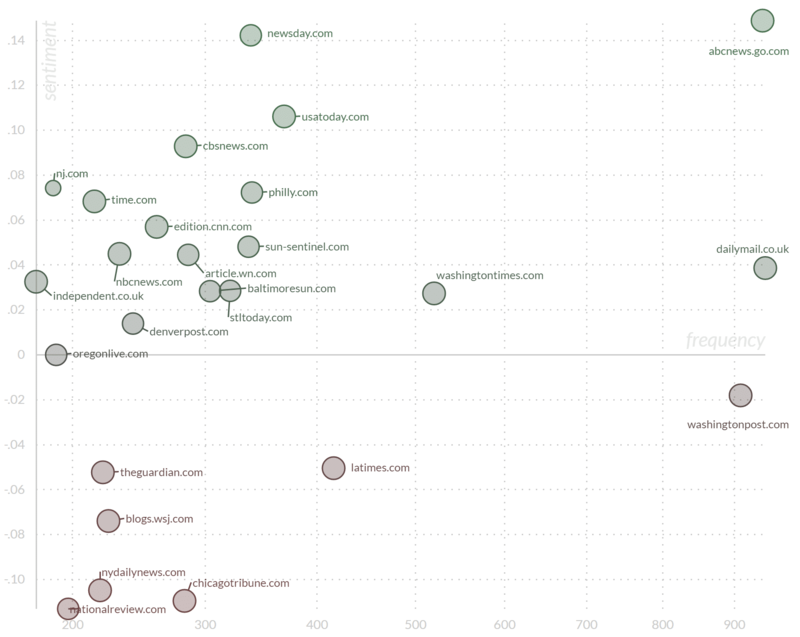 Heated online discussions showed the prevalence of filter bubbles and echo chambers in the global dialogue. 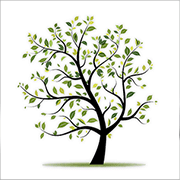 Web intelligence technologies are uniquely positioned to analyze such phenomena. While the influence of social media is not novel, in the 2016 election cycle the Twitter postings of the candidates themselves became key moments that would shape the public debate for days and weeks. Surprises from both sides kept fueling the online discussions. 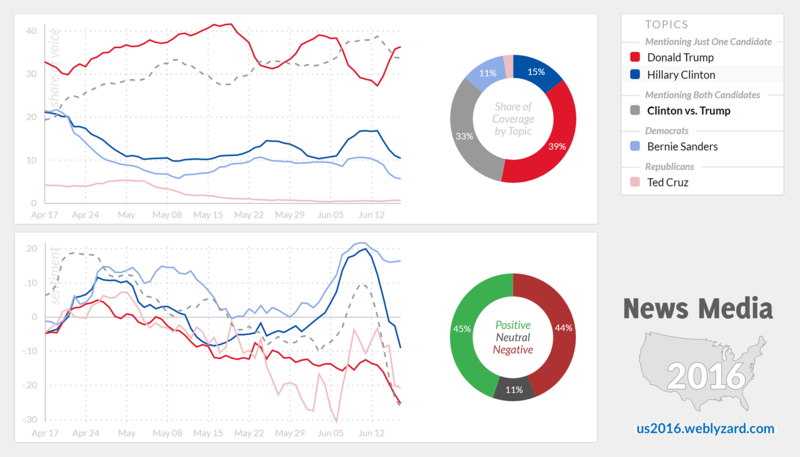 They measure sentiment, for example, by associating candidate references with positive and negative expressions. 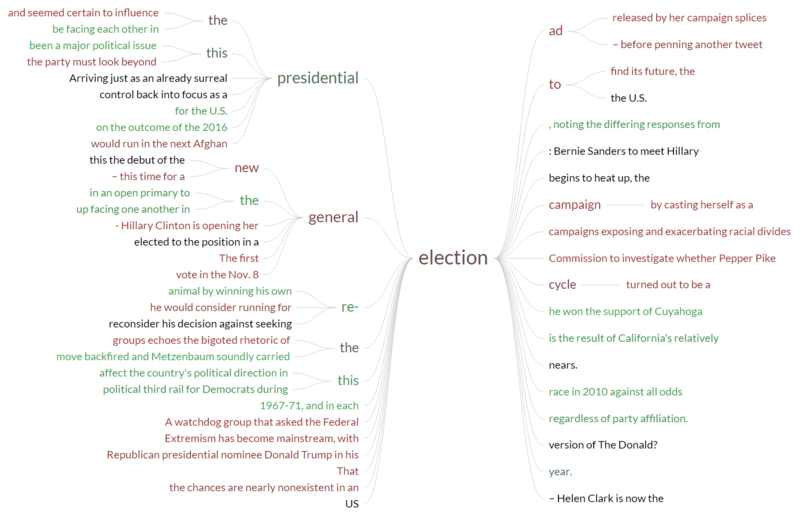 Keywords, grouped by political party or geographic region, reflect events and emerging stories associated with the candidates. 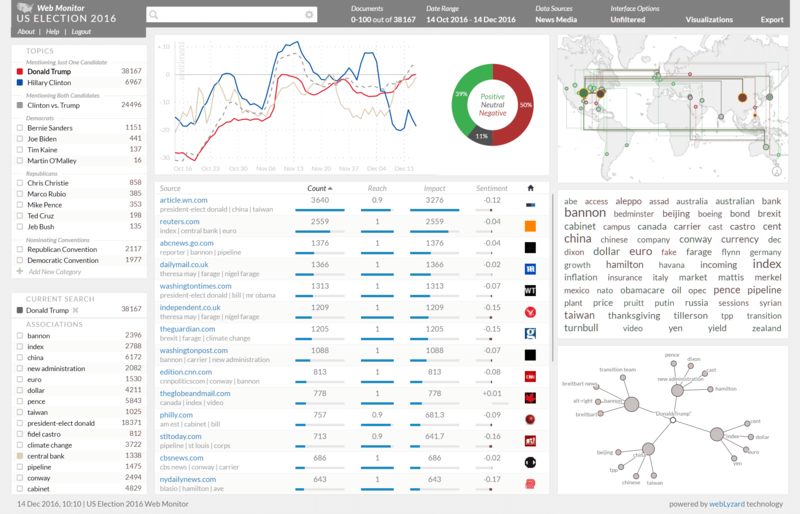 The visual dashboard of the Web Monitor provides a rich portfolio of interactive tools. 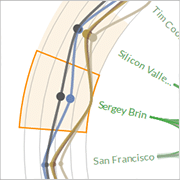 This includes trend charts, network graphs, word trees and geographic projections. 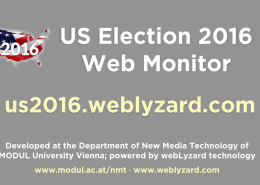 In June 2016, the US Embassy Vienna organized a joint presentation of Prof. Hans Noel from Georgetown University and webLyzard’s Managing Director, Prof Arno Scharl, to launch the US Election 2016 Web Monitor. In October 2016, the system also featured in a TEDx talk on “Analyzing the Digital Talk: Visual Tools for Exploring Global Communication Flows” (see references below). 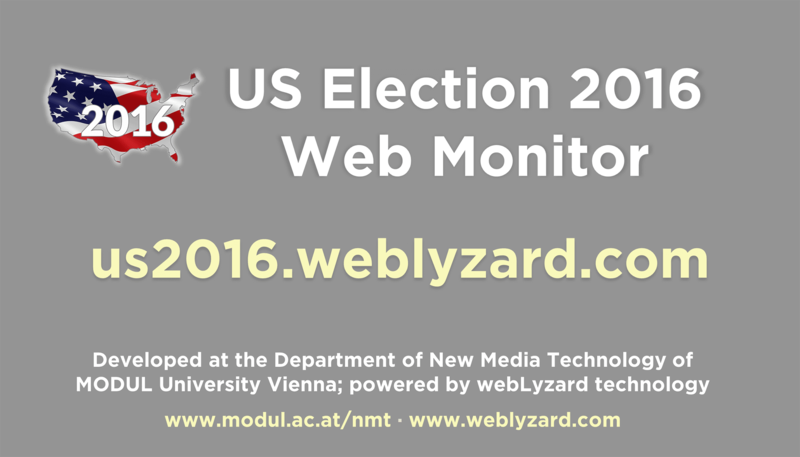 The US Election 2016 Web Monitor is jointly pursued by researchers of MODUL University Vienna, webLyzard technology, the Vienna University of Economics and Business and HTW Chur in Switzerland, who have a long history of successful collaboration. Eight years ago, a monitoring application for the US Election 2008 won the “Online Communities, Web 2.0 and Social Networks” category of the Austrian National Award for Multimedia and e-Business. The underlying technologies and the visual dashboard are continuously being extended within the context of major EU research projects funded within the 7th Framework Programme and Horizon 2020 (DecarboNet, Pheme, ASAP, and InVID). Scharl, A. (2016). “Analyzing the Digital Talk: Visual Tools for Exploring Global Communication Flows“, TEDx talk at MODUL University Vienna in October 2016. Scharl, A. and Weichselbraun, A. (2008). “An Automated Approach to Investigating the Online Media Coverage of US Presidential Elections”, Journal of Information Technology & Politics, 5(1): 121-132.